Two of my best friends, JD & Max & their female human, Clare are hosting a wonderful auction to help Shelby. 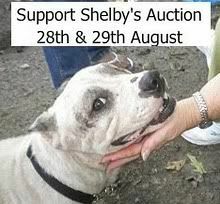 You can visit Shelby’s auction page to donate directly or bid on wonderful items that have been donated by lots of different people. Please do what you can, any little bit helps, and drop by to see JD & Max to tell them what a great job they’re doing. What a wonderful caring thing to do – we'll stop by and see if we can help out. Thank you so much for bringing this event to our attention! We will be sure to stop by and contribute for Shelby's cause! Thank you for reminding everybuddy, Oskar! I hope that JD and Max raise lots of green papers! Oh, thanks so much for the woof-out on this! Bids are coming in left, right and centre and we're SOOOO excited!! We really hope we can make a difference for sweet Shelby! PS – FH says she'll mail your FH this weekend about the great idea she mailed us about a few days ago….! Thank you for sharing this precious information with everybody. Thank you for reminding us. We need to check out the auction link! Congratulations on your win at Wyatt's blog! Your cake sounds delicious! We're gonna check it out and I tweeted/facebooked the link too.